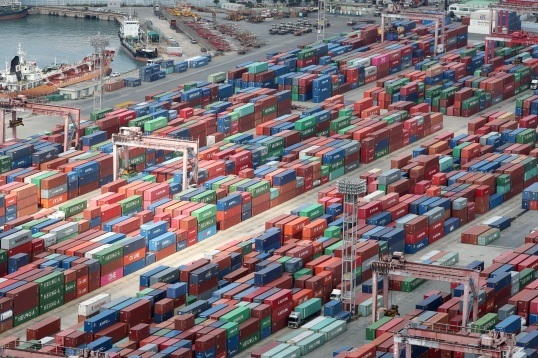 South Korea recorded a current account surplus in October for the 80th straight month on the back of solid goods exports, central bank data showed Thursday. The country’s current account surplus stood at $9.19 billion as of end-October, up sharply from $5.72 billion a year earlier, keeping in the black since March 2012, according to preliminary data released by the Bank of Korea. However, the figure decreased slightly from the previous month when it reached a 12-month high at $10.83 billion. The surplus was largely led by the goods account, in which exports climbed 28.8 percent on-year to a record $57.2 billion, while imports stood at $46.24 billion, up 29 percent on-year, data showed. As a result, the goods account surplus increased to $11 billion in October, up from $8.6 billion a year earlier. In contrast, the services account remained in the red, recording $2.22 billion in deficit in October, easing off from $3.5 billion a year earlier. The chronic deficit in the travel account also diminished on-year to $950 million, reaching the lowest level since November 2016. From late 2016 through 2017, Seoul suffered a visible loss of inbound tourists, as a consequence of the Chinese government’s economic retaliation over the deployment of a US anti-missile system on the Korea Peninsula. The number of foreign visitors to South Korea stood at 1.5 million in October, up 31.1 percent from the previous year, while the number of outbound Korean travelers rose 5.2 percent to 2.3 million. The number of Chinese and Japanese visitors respectively rose 37.6 percent and 61.7 percent on-year. “The reconciliatory mood between the two Koreas has contributed to easing tourists’ concerns about visiting the country,” the BOK said. In the financial account, Seoul’s net assets increased $10.59 billion in October, with $3.36 billion in direct investment and $6.75 billion in securities investment. Foreigners’ investment in the domestic market shed $4.08 billion, reflecting the discouraged investor sentiment amid prolonged trade tension between Washington and Beijing.